Welcome to Lake Como, the preferred vacation getaway for royalty and aristocrats of the past and the jetset of today. A glacial lake bordered by the foothills of the Alps, the area offers stunning views of the mountains overlooking crystal blue waters. Lake Como offers the best as a mix of gorgeous countryside and the most exclusive luxury services. 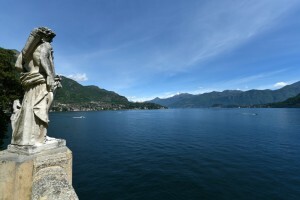 Lake Como is the deepest lake in all of Europe. With over one hundred mile of perimeter, there is a wealth of lakeside areas to explore. Shaped like an upside-down letter Y, it has various and varied areas on each of its legs available to tour. It’s one of the largest and most famous lakes in Italy. Board a cruise to see the small Italian villages nestled into its shores. Marvel at the ornate villas and gardens located on the water. Stroll the romantic promenade along the lake near the medieval walled city. Sample the delicious Italian food and the region’s rich wines. For the adventurer, take advantage of the multitude of outdoor activities: skiing, hiking, sailing, wind-surfing, or even going up in a hydroplane. For a more scholarly approach, meander the historic city center with its artistic gems and museums. To get in touch with nature, rest under one of the olive trees and take in the sights of the snow-capped peaks. Whatever you’re looking for, Lake Como can offer it all. Located only 40 minutes from the international hub of Milan, Lake Como is a concentrated oasis of the best of what Northern Italy has to offer. In under an hour, you can travel from palm-lined lakesides to snow-capped peaks, from a bustling city center to idyllic, natural settings. With its mild climate, thanks to the lake, you can visit Como at any time of the year. The Lake Como region is a literal treasure trove, full of possibilities for adventure, unique and evocative landscapes to discover, a variety of leisure activities, and opportunities to relax and pamper your soul. Come discover Lake Como with My Lake Como Concierge.